When I started this blog, I honestly wasn’t sure whether it would last beyond the first few weeks. How many random humor posts did I have inside me? Ten? A thousand? Ten thousand? The answer turned out to be 41. This is post 42. I’ve run out of funny things to say, and I can’t in good conscience continue trying to write a humor blog — it wouldn’t be fair to me, and it certainly wouldn’t be fair to you. But that doesn’t mean this blog is going away! I’m just taking it in a new direction, and I hope you’ll stick around. My book cover. I designed it myself. If you don’t already have a cat, adopt one (or preferably two) from your local animal shelter or rescue organization. Check this blog each week for new recipes. Prepare a meal using a recipe from this blog every week (or as often as you can). 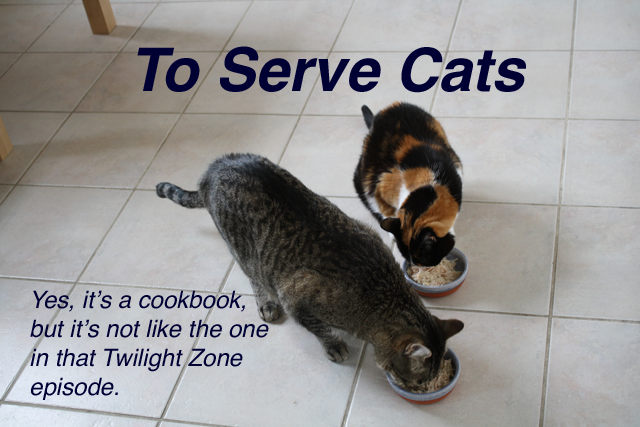 Resist the temptation to eat the delicious meal yourself — feed it to your cat(s) instead. Blog about your experiences preparing the recipe and your cat’s reaction, and add a comment here pointing to your blog post. Or just describe your experiences in a comment here. That’s it! What could be simpler? Please join in — the more, the merrier. P.S. I should mention one more change: although Unlikely Explanations has previously been ad-free, I’ve decided to accept advertising from a few select sponsors. Please take a moment to check out these fine products from our first two sponsors: the CatSofa and the Squeaker 3000 Robotic Toy Mouse. Update: Recipe #1 is now available! This sounds interresting, a little help with nice dishes for cats. I think the market is flooded by cookbooks for humans, but I don’t think I’ve ever seen one for cats. There’s already too many cat-themed blogs. I suggest you change your focus to something more exotic and appealing. Wombies come to mind. Ah! See that is why one should read blog posts in order! I do have a dog cookbook planned, but in the meantime I’m working on a short pamphlet called Dogs Will Eat Anything. It seems like three members of your household all agree about who the cats and dogs. Are you absolutely sure you’re right and they’re wrong? I mean, so far the voting seems to be 3 to 1. Maybe you should get a second opinion. HAHA! Please pass me that pamphlet once it’s done. I’ll need to read it! I’m not sure about the cat – dog thing…I guess a second opinion is needed and I think I know just the right candidate…the little tree shrew that visits my garden every evening. I bet he’ll know which is the cat and which is the dog! I read this post to Lucy (our cat) and her response is: “About time!”. Lucy has a question for you. Do you intend also to cater to cats who have special dietary requirements? Lucy has IBS and is allergic to certain (make that a lot!) of animal proteins (as you probably can guess, this is a bit of a problem if you’re a cat). She getting really tired of having the same two food options day after day. The vet assures me that cats are fine with this, but Lucy doesn’t agree. While her “venison and green pea” option might sound fancy, after eating it for a couple of years straight, it’s becoming really rather bland. Thank you for your valuable feedback. I hadn’t originally taken cats with special dietary needs into consideration, but that does sound like a good idea. I’ve given one of my interns the task of indexing all the recipes according to what proteins they contain. I can imagine how sick Lucy must be of “venison and green pea”. If she’s craving variety, To Serve Cats has at least one recipe that I’m sure she’ll love: Green Peas and Venison (sadly, Peas and Green Venison failed the initial taste-test and didn’t make it into the book). Kitties!!! Thanks for the links to your cats. I used to have a calico, but now I have a black cat, so I have to get my calico kitty addiction through other people’s cats.